New Horizons has entered the asteroid belt and will be traversing this part of our solar system through August. The schematic view above shows the scale of the asteroid belt compared to the orbits of Earth, Mars and Jupiter, each shown in blue. The sizes of the asteroids in this illustration are vastly exaggerated - the belt is in reality almost entirely open space. The "Trojan" asteroids orbiting ahead and behind Jupiter are a different dynamical class of small bodies in our solar system. 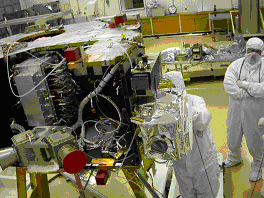 Alice (above the technician in the foreground) and Ralph (below just below Alice and in front of the technician's head) undergo fit checks during the early construction of New Horizons at APL in late 2004. Both instruments completed their primary door openings and first light observations in May. 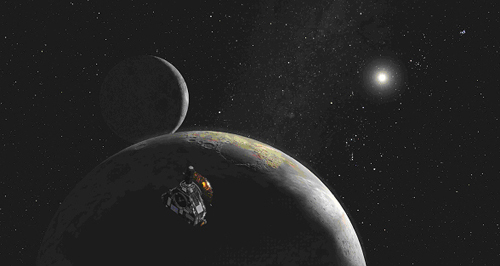 May, like April, was a busy month for New Horizons instrument payload commissioning. In particular, our instruments LORRI, PEPSSI, Alice and Ralph all continued their in in-flight checkouts. In addition, the spacecraft itself received a new suite of onboard fault protection autonomy software resolving a number of bug fixes discovered in ground and flight tests. We continue to see software-induced guidance computer resets once or twice per month, but the spacecraft recovers flawlessly from these, without any interruption to plans. The team is working on software that will resolve the bug that causes this; we expect to have that load tested and aboard the spacecraft around Oct. 1. Highlights of our payload commissioning activities included door openings for PEPSSI (May 3), Alice (May 20) and Ralph (May 29). The Student Dust Counter (SDC) registered each of these events at the precise time of the door openings by the noise they made on the spacecraft. Each of these instruments also saw "first light," i.e., detecting signals from stars (Ralph) or the interplanetary medium (PEPSSI and Alice). From these tests, we appear to have a little higher than spec sensitivity with Ralph's color and panchromatic cameras. Also, Alice's background counts are only about half what we predicted, indicating that the Radioisotope Thermoelectric Generator (RTG) induces a significantly lower background than we estimated before launch. This lower background rate will significantly enhance Alice's signal-to-noise ratio on faint spectral features. From the Alice, Ralph and PEPSSI testing this month we can say that from all of the data surrounding the careful, step-by-step instrument commissioning activities to date, our instrument payload continues to perform as well or better than predicted from ground testing. This is a testament to the exacting engineering that went into their development. In other news for May, we began to finalize the suite of observations planned for next year during our Jupiter flyby, and we continued to track New Horizons to determine whether a fine course correction will be needed this fall. So far, no course correction appears necessary, but the final verdict won't be in until we have about another 90 to 100 days of tracking. Planning activities began in May for the annual 60-day checkouts we'll perform each year during Cruise 2 ("Glen's Glide") - the coast from Jupiter to Pluto. From 2008 to 2011, these checkouts will occur in the fall. But from 2012 to 2014 our annual checkouts will occur in the summer, because we'll be rehearsing the Pluto encounter aboard the spacecraft and we want the Earth-Sun geometry at rehearsal time to faithfully reproduce what will occur at the actual encounter in summer 2015. Now let's talk about the significance of our current location: deep in the solar system's asteroid belt. As both the title and the first illustration in this month's blog indicate, we're traversing the main asteroid belt now. This region of the solar system consists of a handful of dwarf planets, like Ceres (itself 1,000 kilometers in diameter), and literally millions of debris bits created by collisions between asteroids. These small bodies range up in size from mountains to objects as large as 100 kilometers across. The asteroid belt also contains innumerable boulders, rocks and dust motes created by the same collisions. There are many good Web sites describing what is known about the asteroid belt. One I hope you'll like can be found at: http://www.solstation.com/stars/asteroid.htm; another good site is http://en.wikipedia.org/wiki/Asteroid_belt. The first spacecraft to transit the asteroid belt was NASA's Pioneer 10, which made its epic crossing in 1972 on the way to the historic first encounter of a spacecraft with Jupiter. Later, Pioneer 11, Voyagers 1 and 2, Galileo, Cassini, NEAR and Ulysses all made the same kind of journey to or across the main belt. Now it is our turn. Fortunately, the asteroid belt is so huge that, despite its large population of small bodies, the chance of running into one is almost vanishingly small - far less than one in one billion. That means that if you want to actually come close enough to an asteroid to make detailed studies of it, you have to aim for a specific asteroid. The first such asteroid flyby was made by Galileo in October 1991. Galileo also made a second asteroid encounter in 1993. Other spacecraft, most notably the NEAR (Near Earth Asteroid Rendezvous) mission, have also made close main belt asteroid flybys, yielding important geological and geophysical insights into these bodies. Galileo also made the first discovery of an asteroid satellite in its 1993 flyby of asteroid Ida -since then, ground-based observers have found dozens of asteroid satellites. In addition to main belt asteroid flybys, NASA's NEAR and the Japanese Hayabusa mission have both made orbital rendezvous and landings on asteroids closer to Earth. And next year, NASA plans to launch the Dawn (http://dawn.jpl.nasa.gov) Discovery mission to orbit two of the largest asteroids - Vesta and Ceres. Dawn will arrive in orbit about Vesta in 2012, and will reach Ceres, the largest asteroid, in August 2015, just a month or so after New Horizons encounters Pluto. A long time ago, we considered the possibility of targeting a close asteroid flyby with New Horizons during our crossing of the main belt. As the mission PI, I rejected this early on for two reasons. First, such an encounter would take about half of our Kuiper Belt fuel to accomplish. Secondly, even for this amount of fuel, the only asteroids we could hope to reach would be tiny - just a few kilometers across. While such an encounter would certainly be scientifically useful, it couldn't be justified for the amount of Kuiper Belt fuel it would cost us. And when all is said and done, our job is to reconnoiter bodies in the Kuiper Belt. Although we specifically decided not to target any asteroid, after launch we did conduct a thorough search for chance encounters along our trajectory. Just the statistics of such chance encounters indicated that we might expect to pass perhaps 1 million to 3 million kilometers from a small asteroid by chance as we transited the main belt. We found several such opportunities back in February. 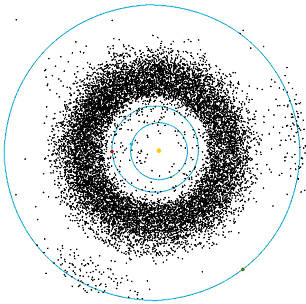 But, as it turns out, we got more than what we expected: in early May we also discovered that we'd pass within approximately 104,000 kilometers of the little-known asteroid 2002 JF56 on June 13! This little mountain-sized body (http://smass.mit.edu/2002jf56.html) is only 3 to 5 kilometers across; virtually nothing is known about it - not even its compositional type or its rotational period. 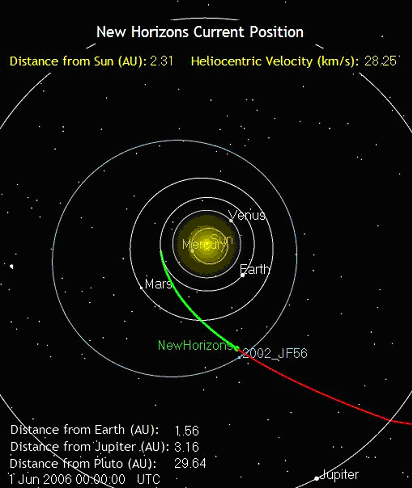 Although we cannot resolve something as small as 2002 JF56 from this distance with Ralph (LORRI, which has higher resolution cannot open its door until late August to guard against accidental Sun pointings), the June 13 "encounter" with 2002 JF56 is still going to be useful to New Horizons. The primary use of this distant flyby will be to test Ralph's optical navigation and moving target tracking capabilities. We will also get a handle on the asteroid's light curve, composition, phase curve, and perhaps even refine its diameter if all goes as planned. 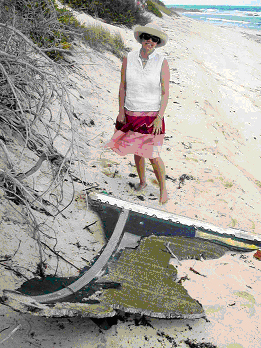 But this event is really a flight test, so we aren't guaranteeing anything but a best effort. If it works, you'll see images that just barely resolve the asteroid into perhaps 1 or 2 pixels and perhaps a spectrum of this chip off some larger body. More importantly, of course, we will gain some valuable experience that will yield benefits at both the Jupiter and Pluto flybys, so we're excited to give this a try. Stay tuned, we'll report on the results at mid-month on this Web site. Flight activities for June will center on SWAP instrument testing, Ralph instrument calibrations, and beam mapping observations for our high gain antenna and REX (radio science) instrument. By July 4, we'll be 3 Astronomical Units (au) from the Sun. Although the sunlight there is still 100 times as strong as it is on the brightest day at Pluto, it'll be about 10 times dimmer than at Earth's orbit. Less than six months into a 114-month journey to Pluto, New Horizons is beginning to reach the cooler thermal conditions it was designed to thrive in! Well, that's all I have for you for now. So until next time, keep exploring. 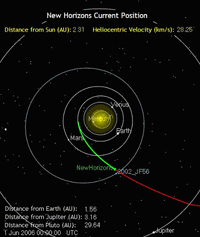 On June 13, New Horizons will pass approximately 104,000 kilometers from a small main belt asteroid called 2002 JF56. This fortuitous encounter is too far away for detailed imagery, but it will allow us to test our moving target tracking capabilities. The positions of 2002 JF56 and New Horizons are illustrated here for June 1.